The French eating of dogs became a minor controversy in 2001 when actress and animal rights campaigner Brigitte Bardot criticised Koreans for eating dog meat. ‘Doctor Dogmeat’ wrote a strong rebuttal of Bardot’s views, defending the Korean practice of eating dog meat and listing the numerous times that the French have eaten dog meat. 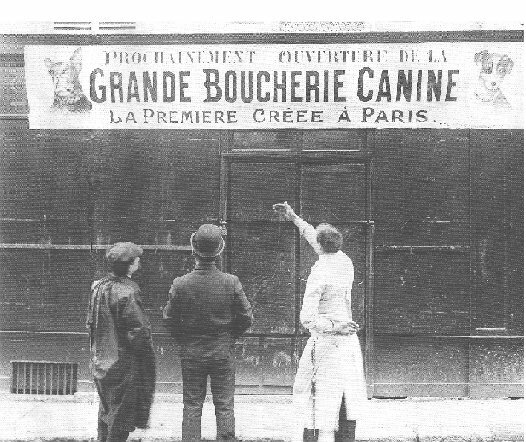 With this controversy mind, I was pleased to come across the following photo of a Parisian ‘dog butchers’ from the early twentieth century. Unfortunately I have not yet been able to find out any more about the butchers in the libraries or archives. Hopefully I’ll come across something soon. 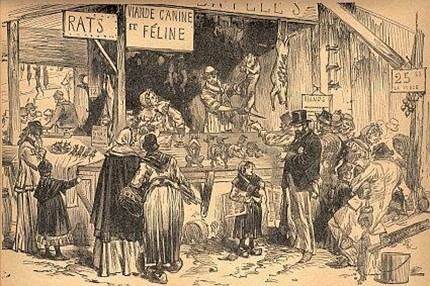 Nonetheless it brought to mind another time when Parisians ate dogs: the 1871 siege of Paris. During the Franco-Prussian War, Prussian troops surrounded the city for several months. With food in short supply, Parisians turned to little consumed meats. Some of these culinary adventures have become part of the city’s mythology. One notable episode was when a select group of wealthy inhabitants of the famously food-obsessed city infamously feasted on the zoo’s elephants, yaks, and zebras. In this case, commercialism (the meat was purchased from exclusive butchers) and a desire to demonstrate character, explain the devouring of these exotic meats, rather than the exigencies of hunger. It is difficult to establish how much of these unusual meats were consumed. Reports of their consumption have undoubtedly been exaggerated for humour (in Sheppard’s case) and to demonstrate the resilience and ingenuity of Parisians during the siege. One poem scrawled on a butcher’s cart declared that Paris would never been beaten by hunger; once all the horses are gone, Paris ‘will eat its rats, cats, and dogs.’ But like the zoo animals, dogs, rats, and cats were only available to the rich; a rat cost almost three francs in January 1871 (or the daily pay of two soldiers). The eating of these animals highlights how the war altered human-animal relations and bestowed new roles on the city’s animals; pets and pests became food. The episode is interesting because it shows how wartime can disrupt “normal” relationships between animals and humans (for more on the environmental history of the Franco-Prussian War, please see my new book Mobilizing Nature, published by Manchester University Press). The war created new economic and social demands that quickly shifted cultural attitudes and expectations about what kinds of animals it was acceptable to eat. On the other hand, the fact that a “dog butcher” apparently opened for business forty years later suggests that the dog-eating episode of 1871 may not have been as exceptional as one might think. Either way, the eating of dogs underscores the diverse roles they’ve played in human history as pets, workers, pests and food. They truly are the versatile animal par excellence. Rebecca L. Spang, ‘“And they ate the zoo”: Relating gastronomic exoticism in the siege of Paris,’ Modern Language Notes, 107 (September 1992), 752-73; Hollis Clayson, Paris in Despair: Art and Everyday Life under Siege, 1870-71 (Chicago: University of Chicago Press, 2002),173-7. Nathan Sheppard, Shut Up in Paris (London: Richard Bentley & Son, 1871), 152. Adolphe Michel, Le siège de Paris, 1870-71 (Paris: Librairie A. Courcier, 1871), 262-4. Michel, Le siège de Paris, 265. Bertrand Taithe, Defeated Flesh: Welfare, Warfare, and the Making of Modern France (Manchester: Manchester University Press, 1999), 112.